Annapurna Circuit Trek, Nepal - What You Need to Know! This is my mega blog post to trekking the Annapurna Circuit in Nepal with the intention of giving you the best advice possible by writing the blog post I wish existed before I did my trek. It'll help with other treks as well, including Everest Base camp, as a lot of the advice like hiring a porter, guide, porter-guide, or doing the trek solo will be the same as well as what gear to pack, where to eat, where to sleep, and how to get the most of your trip. As i'm writing this, I'm actually sitting in a tea house on the trek and now putting the finishing touches on it now that I'm back in Pokhara. 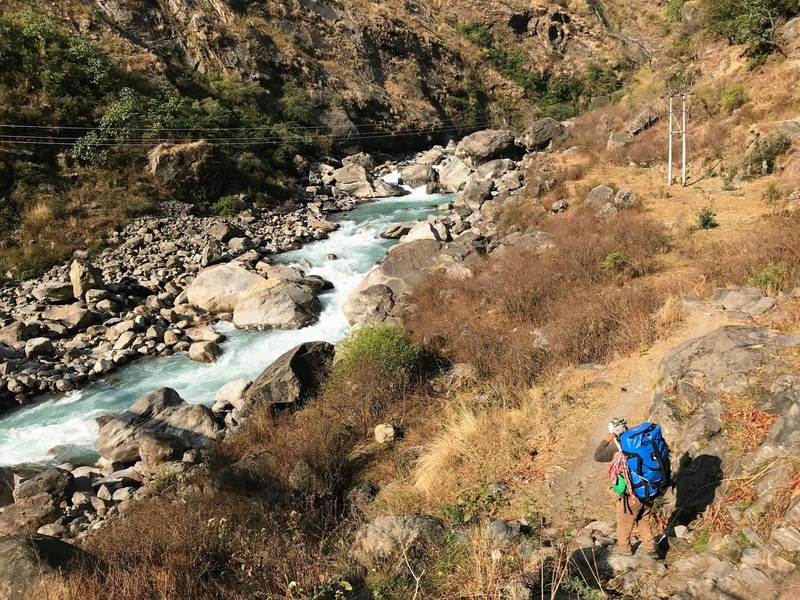 Even during the first few days of the trek, I already created a list of things I wish I knew before coming, and that the countless other blog posts and youtube videos I watched prior to my trip missed out on or completely skipped. This post will start as day by day journey on my route, the difficulty, elevation, where I stayed, and things I would have done differently. 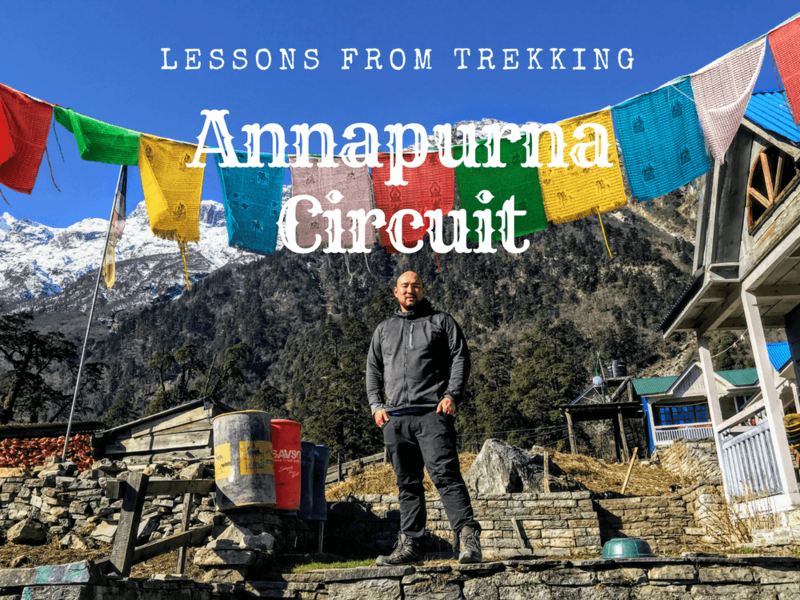 I hope you enjoy this blog post, I have a feeling it'll be more informative than even many of the guide books to Annapurna Circuit or Trekking Nepal will offer. As I plan on sharing both the good things as well as where I messed up, mistakes I've made and lessons I've learned along the way. It'll help you plan your trip so you don't' make the same mistakes as I did, and most importantly it'll help you get the most of your trek through the beautiful mountains of the Himalayas. There are a couple of things you'll need to prepare before you go on your Annapurna Circuit Trek. First being the best time of the year to do the trek which is either March/April or then again in October/November. At other times of the year there is either too much snowfall to get through thorong la pass or you have too much risk of avalanche. Personally I did the trek at the beginning of March and it was a bit too early this year as there was a lot of snow up top at the pass and it completely covered tilicho lake and the path to get there which would have been a good side trip as well as way to acclimatize further before going up. You'll want to get a minimum of a 30 day visa when you arrival in Nepal at the airport, but chances are, you'll want more time here. 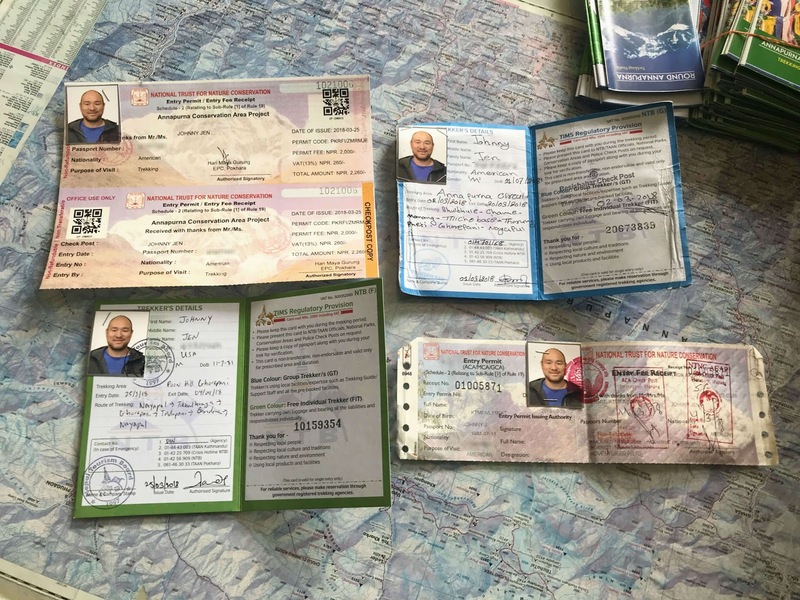 Your two options are to either pay for a 90 day visa at the airport, or if you want to save some money and know you're here for a shorter time, you can extend your visa in Kathmandu or Pokahara before your trek. Aside from planning your times and trip lengths, you'll also need to apply for your ACAP Permit (Annapurna Conservation Area Project) and Trekkers’ Information Management Systems (TIMS) card while either in Kathmandu or Pokhara. I went to the office in Lakeside Pokhara and it was super easy. I arrived at 10:30 and was done by 11:00. Just bring your passport, 4,500 rupees ($42US) and if you have some extra 2x2 photos bring them with you. If you don't, you can take them there for free. While you're there you can also extend your visa to Nepal in case you just got the 30 day visa like I did and wanted to extend longer which actually saves you money versus buying a 90 day visa if you're only here for 45 days like I am. On a side note, you'll also want to download plenty of podcasts, (Travel Like a Boss) audiobooks, and netflix shows onto your phone or tablet while you still have good wifi. The one must have app everyone should download before they come is Maps.me which is free for both IOS and Android. Make sure you load the map you'll be using on the trail as it works amazing in offline mode. I must had read dozens of blog posts before going on the Annapurna Circuit and even though most of the advice was good, I felt like I had to sort through them to find the little tips and tricks that I wish someone would have told me. So now that the trek is finished, I can definitely tell you what you need to bring, and more importantly, what you can leave behind. A lot of people don't realize but you can leave a bag at your hotel in Kathmandu, or even arrange to have your bag sent to Pokhara to wait for you at the end of your trip. That way you can just take what you'll actually need during the trek and keep your bag light. For me, since I wanted to record and edit both videos and podcasts along the way, I opted to bring my laptop, a 13" Macbook Air as well as a portage USB microphone. There was always a place to charge your phone and laptop and at least for the first six days there was an outlet in your room for charge for free but starting at Upper Pisang and for the final days of elevation, expect to have to leave your device at the front desk to charge overnight. Aside from my laptop, which I honestly don't recomend most people bringing the rest of my list can be applied for just about anyone. So here it is in total, including what you'll be wearing on you at any given time. I've included links whenever I could to give you an example of what i'm talking about. If you do end up buying something, make sure you use my links below so I can get credit for referring you. This list should be very similar to Everest Base Camp or any other trek in Nepal. 1x Hiking Boots - You can get away from waterproof hiking shoes if there isn't too much snow at the thorong la pass but I would recomend boots just in case. Make sure you buy these at home and break them in for at least a few weeks on a couple of hikes before you come. I bought a pair of Forclaz 100 Boots from Decathlon and have been perfectly happy with them. Just make sure you buy a size up from your normal shoes to give your boots plenty of wiggle room. 1x Sandals - These will be worn mostly around the guest house and to and from the outdoor bathrooms. You'll want a pair you can wear socks with to keep warm at night. 6x Hiking Socks - The best would be Merino wool socks. I was able to find wool socks for really cheap (less than $3 a pair) in Kathmandu at Kalapatthar Trekking store in size 45 (11US). You can get away with less if you wash your socks everyday in the sink, but in my experience they don't dry in time so I'm glad I had multiple pairs. 1x Hiking Pants - You'll be tempted to buy ones that zip off into shorts, but aside from the first 2 days, it'll never be hot enough to do so. You can just wear thin, comfortable hiking pants. 2x Thermal Underwear - Also known as long underwear or base layers, you'll freeze after the first few days and once you put them on, you won't want to take them off. Best would be merino wool base layers to keep you both warm and dry but any synthetic will do. 2x Quick Dry Underwear - You won't be showering everyday as it gets too cold to want to do so, and "hot water" showers are usually either outside in the cold or otherwise not worth the effort until you're really dirty. My favorite travel underwear is the Exofficio Boxer as they're comfortable and can be worn instead of swim trunks during your hot spring visits without anyone noticing. 1x Rain Pants - You'll wear this over your normal hiking pants on days where it gets really cold, as well as days it rains a lot. The best rain pants will have zippers on the bottom so you can take them on and off without taking off your boots. 1x Sleep Pants - You'll want to change of our your hiking pants when hanging out in the dining hall, so bring a pair of lightweight PJ bottoms to go over your base layers to lounge and sleep in. 2x T-Shirts - Make sure they're quick dry and synthetic. My favorites are the basic Northface t-shirts. 2x Long Sleeve Shirts - You'll want Merino Wool base layers if you can get them before you come. Another option is any long sleeve, tight synthetic shirts. 1x Down Jacket - You'll be freezing at night as well as during the high altitude days of the trek, so you'll definitely need a down jacket. I'd debate over buying a lightweight one like this or just renting a heavier version from Kathmandu. My suggestion is that if you need a puff jacket anyways, get a good quality lightweight one. If you're a beach guy like me, then just rent one. 2x Buffs - You can get any multifunctional headband, but Buff is the original. They're great for scarves, ear warmers, hats, and to wear as a dust mask. 1x Day Gloves - These will be lightweight for casual day use when it's cold out but not yet freezing. 1x Snow Gloves - These will be for night wear as well as the pass. 1x Trekking Poles - These are essential to save your knees on descents as well as help you through the long hike. You can buy a knockoff pair in Kathmandu for $15 or bring some from home. 1x Water Bottle - Bring a reusable 1 liter Nalgene Water Bottle with you to use along with water purification tablets that you can buy in Kathmandu for around $3 for 50. Optionally you can bring a second 1L bottle to pee in for the nights you won't want to leave your room and go outside to use the bathroom, highly recommended. 1x Suncream - Technically you'll need SPF 30+ at higher altitudes, but i'd recomend getting the smallest bottle you can find as they're annoying to carry. Also get some SPF Lip balm as well. 1x Sunglasses - You'll want polarized sunglasses like the ones SunGod makes to prevent snow blindness at high altitudes where you're closer to the sun. 1x Backpack - You're you're hiring a porter like I did, you'll want to keep your daypack to around 35L/40L, but if you are carrying your own gear, try to stay at 65L or less so you don't overpack. 1x Sleeping Bag - You can rent one in Kathmandu but they'll be bulky and not that warm as they're all knockoffs. If you prefer you can bring an ultralight 0 degree f sleeping bag with you, but most people just deal with the rentals. All guest houses will have some type of blanket and pillow as well you can use along with your sleeping bag. 1x Head Torch - You'll want it for when the guest houses randomly don't have electricity for the night. Keep a set of spare batteries as well. 1x USB Power bank - I just had a small one to charge my phone during days where the village was out of electricity and it worked great. 1x Diamox/Acetazolamide - These are the altitude sickness pills you can take as prevention. They can be bought for less than $3 per pack if you ask around enough pharmacies in Kathmandu. 40x Activated Charcoal - These little tablets will save your stomach and is the best cure for diarrhea which you are pretty much guaranteed to get at least once if not a few times during your trip to Nepal. I bought 30 tablets with me and between myself and giving them away to people I ran out and for whatever ridiculous reason they don't sell them here in Nepal. 50x Water Purification Tablets - Use 1 per liter of water and let sit for 30 minutes, then you can drink tap water during your treks and save money and plastic. Get them for $3 in the city. 1x Cash Money - There are no ATMs along the way so bring all the cash you'll need with you. I would suggest budgeting around $25 a day, and having a small buffer. Having 52,000 Nepal Rupees on you which is around $500 should be more than enough for your trek. I always carry an extra $200US on me just in case as US Dollars are accepted most places in Nepal. SIM Card/Data - Do not get Ncell, it's completely useless the entire way up and down Annapurna Circuit. Instead get NTC which had at least some reception on most places on the mountain. Best Month to Go: The only two trekking seasons for Nepal and the Annapurna Circuit is from March-April and again from October-November. Other times it's either too cold, rainy or humid. The Oct/Nov season is the best as it's after the rains which means the skies are most clear for the best views, but March/April isn't bad and is less busy at this time. Bring Less Stuff - You'll be tempted like I was to bring guidebooks, maps, chocolates, nuts, granola bars, and other snacks with you on the trek. My best advice is don't. You can buy plenty of food, tea, and drinks at guest houses along the way, and it's not worth carrying extra stuff with you. Skip the coffee and have a masala chai tea instead, and even though Snickers are expensive, it's easier to buy one at a time than to carry a bunch of things with you from the start. Drinking Water - Don't buy and waste plastic bottles, especially on the trek where they burn their garbage incuding plastic products. You can drink the water straight from the tap even without purification while on the mountain. I did it along with the local porters and guides as well as some other hikers without any issues. Just don't drink the water in Kathmandu, Pokhara or near Thorang Phedi/Thorung Pass where their infracture isn't great. Walk Slowly - Even though you'll be tempted to power through and blast away at the days to get to further ahead into the next village or even closer to the top, don't. Old people who walk slowly almost never get altitude sickness, it's the younger trekkers who push too hard that end up getting sick. If Sick, Stop - Whether you get fatigue, headache, insomnia, loss of appetite or any other signs of altitude sickness, or even if you just get a cold, stop climbing higher. Stay another night exactly where you are, or even go down to the next village. Altitude sickness is easy to prevent or cure, if you catch it early, but it magnifies if you go higher, don't do it under any circumstance. It's easier to lose a day or two staying where you are or going down one village than risking losing your whole trip by pushing forward. 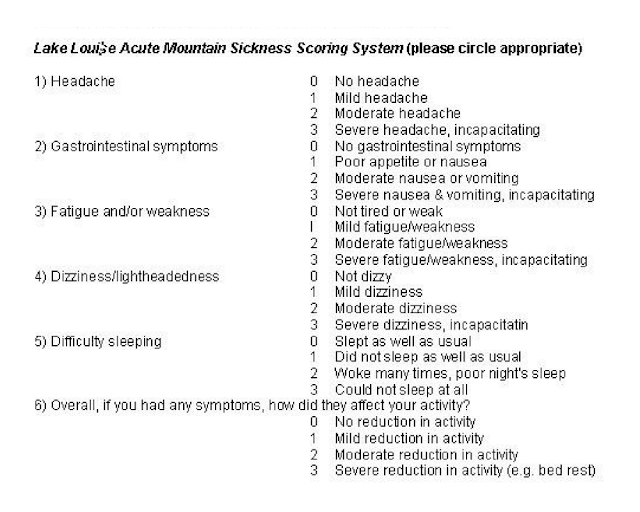 Write down the symptoms of altitude sickness and make a plan on what to do before you get it. The biggest decision you'll have to make before going trekking in Nepal is whether you want to do it with a guide as part of a group, hire yourself a private porter-guide, or go solo. The best case scenario would be to go with a group of friends and hire your own guide and porters. That way you can have the flexibility of going on your own schedule, but also the help when needed. You can also try your luck joining a group on sites like Book Mundi where you can read reviews on tour companies and save money though joining another group tour. Even though it's possible to do the trek without a guide and plenty of people do it, and even though I accidently booked myself a terrible guide, his experience still came in useful when it came to forks in the road and not getting lost so if I don't regret going with a guide, especially since I was hiking solo. 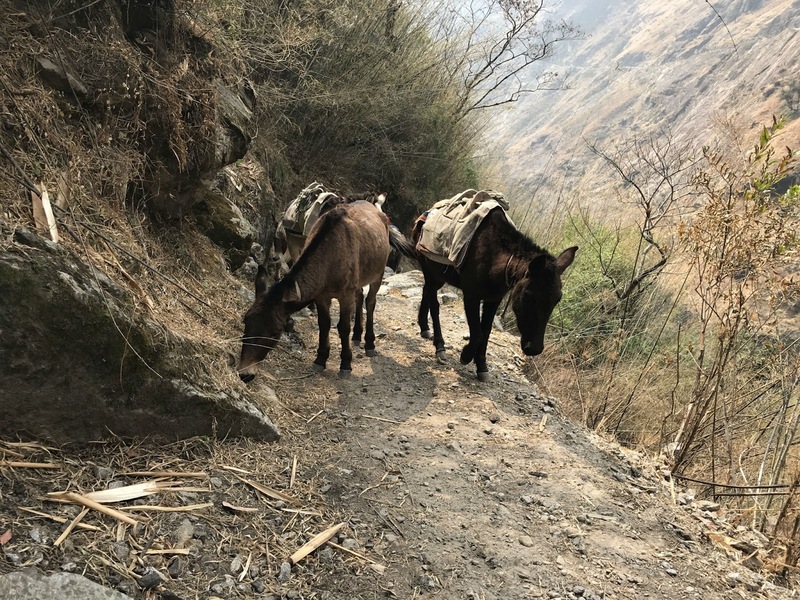 You'll meet other hikers along the way, and you'll be fine 95% of the time on the Annapurna Circuit, but for me, it was worth paying a bit of money to have someone there just in case. If you do hire a guide or a porter, realize that they'll either make your life easier, or often more difficult. My suggestion is to meet your guide or porter in person, and take them to lunch or at least a tea before the trek. You'll be spending 24 hours a day with them for weeks at a time so it's worth seeing if you get along before you start. Make sure they actually can actually comprehend your English and don't just nod and agree to everything you say, and ask them questions like, "What are symptoms of Altitude sickness" and "What do you suggest we do if I start showing 1 symptom, 2 symptoms, etc." As for porters, depending on how much you have them carry, they'll most likely want to walk on the road while you take the high pass through the forest. This makes it a bit annoying as you have to decide in the mornings before hand where to meet each day. The alternative is to get a porter-guide which is what I did, and is a good mixture as they'll walk with you on your schedule, but carry less stuff. In general a porter will carry up to a maximum of 30kg (66lbs) while a porter-guide will carry exactly half of that. A guide will only carry his own gear and 0kg of yours. Typical prices are $15 a day for a porter and $25 a day for a porter-guide or guide. Prices include their meals and housing but tipping at the end for good service is extra. The benefit of an actual guide is experience and levels of English. I thought it was a no-brainer to get a porter-guide as it makes most sense on paper, but at the end of the day, the one I hired made my life more difficult than he helped, so I wish I would have either taken the time to hire someone better, hired a separate porter and a separate guide, or just hired a porter and taken 100% responsibility for guiding myself. Today I woke up at 5:30am to meet my porter-guide and take a taxi to the bus station. We got on the bus around 6:30am, leaving Kathmandu at 7am and arriving at 5:30pm, which was 10 1/2 hours on a bus. Normally I would hate that, as it sounds like torture, but instead, I didn’t mind it. There were great views, and always something interesting to see out the window. You really got to see the country side, towns, and people of Nepal. Even though it was cramped and shaky, I was decently comfortable. Just a warning, make sure you sit behind someone (and not in the first row) so you don’t get tossed forward at every bump. One of the reasons it took so long is that the bus would pick up locals every other block or at least attempt to. Officially we stopped twice, once for breakfast at around 8:30am, then again for lunch at 11am. Make sure you eat lunch and use the restroom even if you don’t need to as after that there weren’t any stops, expect quick ones to check in for your TIMS card. We arrived at Besi Sahar which is the most common starting point by bus at 3:30pm and should have hiked from there which would have taken 3 1/2 hours to Bhulbhule. Our guide mentioned that the ride normally takes a few hours less and that there was unusual traffic that day and that it should have only taken 6 hours instead of 8 1/2. It also started raining around that time so it worked out that we took the bus all the way to Bhulbhule, but my suggestion for anyone doing this trek in the future would be to get off in Besi Sahar and walk the 2-3 1/2 hours or so to Bhulbhule. If you arriving at or before 2pm, you can walk the high pass trail and avoid the road. Or if you arrive at or before 3pm, you can walk the road. It would have been a nice way to get in some miles on a relatively short walk instead of sitting on a bus for even longer. The only caveat is that the sun goes down around 6pm so make sure you arrive in Bhulbhule before it gets dark. After a short walk (15 minutes) and crossing our first suspension bridge, we stayed at Manang Hotel and Restaurant. They had good wifi, a great indoor hang out area, and comfortable beds. There was a basic toilet upstairs next to the rooms, but the sinks were downstairs. As we didn’t actually hike that day, I skipped showering, as it was 3 floors down. For dinner I had a mediocre Dahl Baht, breakfast was Tibetan bread and an omelette which was actually pretty good. Total price was 1,000 rupees ($10US) including the room, dinner, breakfast, and some tea. Slept at 840m at Manang Hotel. Bhulbhule. Wifi, Good, Able to Skype. I woke up excited to finally start the hike and started off at 8:05am with Janina, a solo German girl who I had met on the bus the prior day. She joined me and my porter-guide Mahesh, and it was nice to have the company as I was trekking solo as well. Right away we realized how beautiful the trekking is, even from this low and being so close to the road. The first part was beautiful as we got to see some amazing views of the Himal Chuli and Nadi Chuli mountains right at the start which actually got hidden later in the trek so I’m glad we started where we did. About an hour into the trek, the 10+ kilos (22+lbs) that Janina was carrying on her back started already being too much to handle, and we knew that it would only get harder as we climbed higher, steeper and into higher elevations, so we hired her a porter at the village of Bahundanda for 1,400 rupees ($14US) a day for the remainder of the trip. It’s still pretty crazy knowing that in the 5 minutes after we hired him, he ran home, packed a bag, and told his wife and family goodbye and that he’ll be back in 2-3 weeks. Today’s walk totaled 7 1/2 hours as we left at 8am and arrived at 3:30pm in the village of Jagat where we’re staying now. It’s been a long day, a beautiful one, but i’d be lying if I didn’t say I’m exhausted. The crazy thing is that this is just the start. I still have 17 days ahead of me and 4,000+ meters to climb. Slept at 1,340m in Jagat at Garden Guest House. Wifi - Bad. Able to send Whatsapp messages, but unable to load any webpages. Today we were supposed to sleep in Tal, but since we pushed ourselves yesterday and made it to Jagat, past our original stopping point of Syange, we’re skipping ahead to the village of Dharapani. I was hoping it would somehow shave off a day, but it doesn’t, it just makes the lower altitude days longer and harder, and will hopefully make tomorrow’s climb a bit easier as it’s shorter. But as i'm writing this a day later, it wasn't. Today's hike lasted from 7:30am to 4:00pm which was a total of 8 1/2 hours. We could have shaved off an hour by walking on the jeep road, but since the entire point of the trek is to enjoy the scenery, we insisted on taking the high pass through the forest. It took a bit of convincing my porter-guide but eventually he gave in. Lesson learned is that even though I had very specifically told the booking company I wanted to avoid all jeep roads and take only the hiking paths, the owner of the guide company either didn't communicate that to my porter-guide or Mahesh decided to ignore that advice to make the days easier and shorter for himself. Either way, I'm really glad I eventually made it clear that I wasn't in a rush and would rather have the trek take an extra day or two than skip the beauty. Speaking of which, if you take a 4x4 or a Jeep to shorten your Annapurna Circuit trip, you are insane. 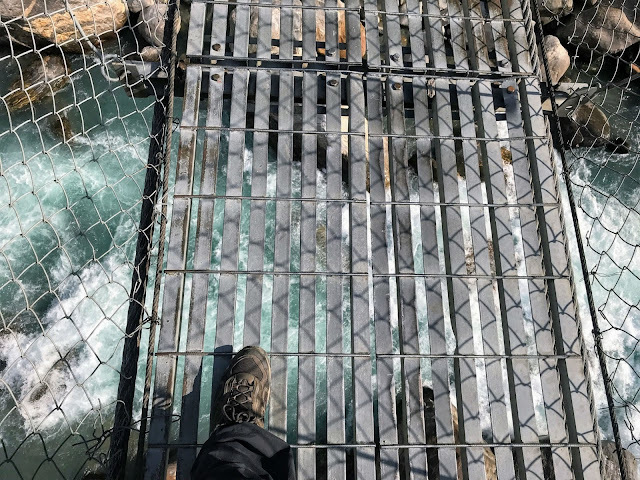 The jeeps are not only ruining the walking trails, kicking up dust, and making the trek itself less pleasant for everyone, but it's also stupid to skip the best parts just to get to the climax of crossing the Thorung La pass. Starting lower and taking your time helps your body acclimatize to the altitude making the trek both more enjoyable and healthier. I'll recap the idea walking ideal schedule I wish I would have done instead of the common schedules you read everywhere on the internet but so far it would have been the following, making sure you follow the red and white sign, and taking the high pass trekking road and not the jeep road everyday. It'll end up taking an extra day, but it'll be a lot nicer, less busy, and it'll give you time to actually enjoy the nature, take photos, and play with the animals along the way. Slept in Eco Holiday Home Guest House, Dharapani. 2160m. Wifi: Good. Choppy but able to create this blog post, upload a few photos, and clear out my email inbox. Unable to load facebook. It started a clear, gorgeous, warm day. Mahesh finally started taking me on the actual hiking trails, and the scenery through the forest were beautiful. But that quickly changed when it started to rain. Luckily I had brought a really nice raincoat with me and that combined with a raincover for my backpack, I was kept dry. Halfway though today's hike I ran into two Americans from Wisconsin on the trail and ended up hiking the rest of the day with them, getting to the nicest guest house I've seen on a the circuit anywhere called Royal Garden. With attached bathrooms, and newly remodeled rooms, plus a heated dining room, I hope this becomes a trend. The only issue was, the ensuite showers are cold water only, while the hot ones were outside. I decided it would be nicer just to have a quick cold rinse in my room, then crawl straight into bed and warm up. I was wrong. The quick rinse wasn't actually the problem, and I probably would have been fine with just that. But I stupidly decided to lather up with soap from head to toe, and get a final nice clean in before I put on my long underwear. It took me the next three hours of hiding inside the blankets, then having hot tea by the fire to finally stop shivering. This is also where I left behind everything that wasn't vital as the higher we get up in elevation, the harder it's becoming for my porter to carry it, especially when he's on the trail and not walking on the road. Slept in Royal Garden, Chame. 2710m. Wifi, Poor. I'm able to update this blog post, and somehow able to upload a photo to instagram (@johnnyfdk) but unable load gmail. All the goodies I left behind at the guest house. Day 5: WTF happened to me? It started with a terrible night of sleep, waking up every 30 minutes in sometype of weird abstract loop about nothing comprehensible. I ended up getting a few hours of sleep, and felt fine in the morning over breakfast with the exception of getting a bit of a cold. But 10 minutes into the walk, I could no longer keep up the easy pace of the two people had just hiked with the day before and this relatively flat 7km (4.38miles) stretch to the Apple Cider (juice) factory which was supposed to just be a stop 1/3 way in. What was an easy stroll became one of the hardest walks of my life even though the days prior I've been blasting through much harder trails and climbs. As soon as I arrived in the facility I slowly made my way from sitting in the front with the other trekkers, eating apples, to finding a quiet place on the back porch to crawl up and die. This is where I ended up laying on the floor in the sun like a cold blooded reptile for the next 4 hours. At this point I was extremely fatigued, shivering and losing body heat faster than I could soak it back in even under the afternoon sun. I figured maybe I needed to eat, but lunch became the second sign something bad was happening. I had completely lost my appetite and was barely able force down half a plate of Dahl Baht (Lentils and Rice) for lunch even though prior to today I've always been happy to receive seconds. I figured I just needed some rest and was thrilled that the Bharatang Tea House, the only business open for miles was also a hotel. The nightmares went away but was replaced by something worse and a lot more real. Everytime I finally feel asleep Mahesh would come into my room, wake me up and ask if I needed anything. I did, I needed to be left alone and I needed the rest. Slept in Bharatang Tea House, Bharatang. 2850m. Wifi: None. Looks like a beautiful lodge, but the design makes it freezing. I knew I couldn't stay at the apple house another night as it was too cold, had no electricity and since the only bathroom was three floors down. But I wanted a close by place to rest and get over whatever illness I had come across. As far as I could tell I had a severe cold, and I just needed a warm place to rest and recover. We easily make it to next small village Dhukur Pokhari. At this point I have completely lost my voice and it's like feels the worst cold I've ever had in my life. But after a short easy walk, I'm glad we arrive so I can finally find a warm place to get some rest. However Mahesh insists we walk all the way to Upper Pisang as it was only 11am, and even though I was hesitant, I was too out of it to say anything, plus physically I was no longer fatigued like I was the day before, so I went along thinking he'd know best. He didn't. Then it hit me. If anyone knows me in person, you'll know that I've never been the one to say no to food, especially after a long day of exercise. But that's when I knew something was terribly wrong. I knew I had to eat, so I tried forcing down some Dahl Baht, only for my body to reject it and want to vomit seconds later. I try to repeat this process with fried rice a few hours later with the same problem. It was then that knew I was fucked. The only good news was no one came to wake me up in the middle of the night today, but that didn't matter as I didn't sleep a wink. I went to bed at 8:30pm, and laid awake for the next 11 hours. The only good news was I had a lot of time to think and weigh my options about what's actually happening to me and what I should do about it. Slept in Tukuche Guest House, Upper Pisang. 3310m. Wifi: None. They technically had it, but they had no electricity the entire day I was there. A lot of you probably figured it out way before me, but I have altitude sickness. I think the reason why it took me so long realize was the fact that I didn't have any of the common symptoms like headache, dizziness, or lightheadedness. I was convinced that I just had a really bad cold and the cough didn't start developing until today. The fatigue that I had the first day seemed to go away, and other problems would come and go giving me hope. I also couldn't think straight from the lack of sleep and the focus on just not freezing to death. This is when I good guide would have came in handy and the reason why I insisted on hiring one even though plenty of people do it without one. I knew that 95% of the time nothing bad will happen but as insurance I was happy to hire a guide just in case. Unfortunately my guide ended up causing way more damage than he helped. He kept insisting that we keep climbing "slowly, slowly" and that eating garlic soup would cure it all. When I told him I think I have altitude sickness he said "Oh Yes! I already knew" He also admitted that the manager of the apple juice lodge warned him that I definitely have altitude sickness and that he needs to take me down the mountain and to definetely not bring me any higher. Frustrated more than angry, I asked Manesh, "Why in the world would you insist we hike all the way up to 3,310m (10,860ft) knowing that I had altitude sickness?" His cheery response was that since I was walking strong he thought that if I just ate enough garlic soup and went slowly slowly that I would be fine. I wanted to punch him in the face. But as much as I want to blame him, at the end of the day it's really my fault. I should have researched and chosen a better guide company that properly trained it's staff better, and I should have written down hard rules on what to do in each situation instead especially in cases if AMS of relying on my judgement in the field. Manesh has a good heart and tries hard, a bit too hard actually. But the fact that he didn't know the simple concrete rule of "never in any situation accent higher once you start showing symptoms of altitude sickness (acute mountain sickness)" shows that his employer didn't give him any proper training. I should have listened to my gut when I went into the guy's office in Kathmandu and he seemed to brush off any of my actual trekking related questions. Or when he talked over Manesh and didn't let me talk to him directly so I couldn't figure out how little English he actually comprehended. Or that he seemed to only care about having me prepay the 19 day trek, followed by how I could help him with his youtube videos. I don't know if everyone reading this knows how severe getting AMS is, but this could be the end of my trip and it could have been the end of my life if I had continued to climb higher. After a bit of mental debate on what to do, I ended up hiring a guy with a motorcycle for $25 to take me back down to Chame which is a 600m drop in elevation. That combined with me starting to take Diamox (Acetazolamide), and planning to rest for a few days, hopefully I'll recover and be able to attempt another climb to the top. Back to Royal Garden, Chame. 2710m. Wifi, Poor. I'm able to update this blog post and some webpages, but still unable to load gmail or facebook. The motorcycle that may have just saved my life. It felt amazing waking up after actually sleeping again for a night. I don't know if it was the Diamox or the lower elevation, or more possibly the combination of both, but for the first time in days I actually slept. Unfortunately, things just keep getting worse. The AMS specific symptoms are starting to get better, but I still have no voice, and have started coughing so violently it hurts. I think this is what dying feels like. Piece by piece your body fails and stops working. My original plan was to stay a few days to rest in Chame where it was below 3,000m, but still only a long day's climb to get back to Upper Pisang. That way I could have the option to continue where I left off and still have plenty of time to make it through the Thorong La Pass located at the top of the climb at an insanely high 5,416 metres (17,769 ft). But then I asked myself, why am I doing this anyway? The younger me did all sorts of stupid things to try to impress others. Even though a lot of things started with good intentions like wanting to learn how to be better with women so I could get a girlfriend and stop feeling so rejected all of the time, turned into bragging about conquests and wanting to become pick up artists. Or how getting into kickboxing so I could get healthy and into shape turned into letting my ego get ahead of me and getting in a ring where we punched, kicked, and elbowed each other in the face until one couldn't take it anymore. Even with my blog it started as a place where I could simply openly share what I was up to and what was working or not, turned briefly into being all about how I was making money and shaming others who were too lazy not to do it themselves. So now that I'm sitting here a very different person from all of the lessons life has brought me. I asked myself again, why am I doing this anyway? That was when without even discussing it with Manesh, I quickly packed my bag and told him, let's go. It wasn't even until we started walking that he knew if we were going up or down. The answer was the latter. For those who are wondering why I came on the the trek in the first place. It wasn't for some sort of challenge or need for accomplishment. In the past it might have been, and if it still was today, I wouldn't "give up" so easily. I have all the time in the world, for me to go back down and try it again in a few weeks if I wanted to. 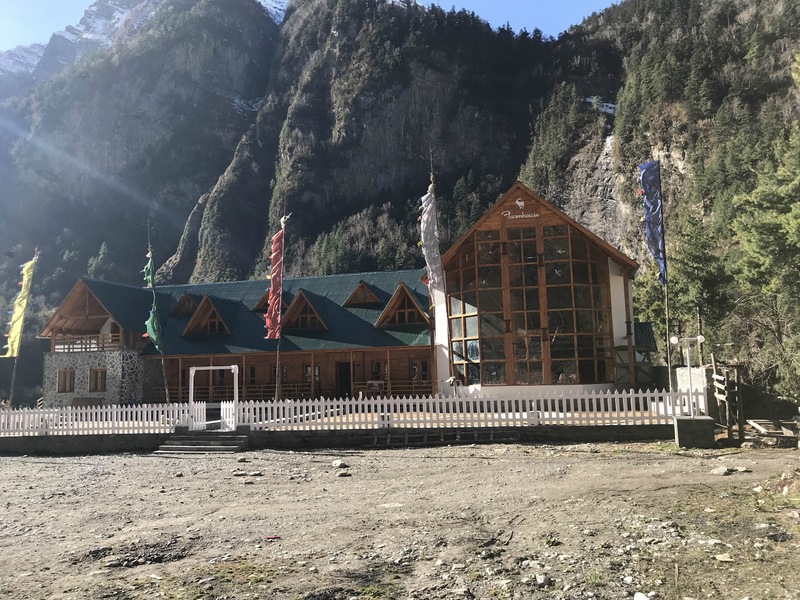 But the honest reason why I came was because I thought I would enjoy it as it sounded like a nice way to enjoy nature and see the beauty of the Himalayas. And honestly the trekking itself I really loved, and I'm glad I got to see the mountains close enough to be in all of its glory. But the part that I really dread is the freezing cold at night, it's miserable and no amount of warm clothes can make up for it as the guest houses are never insulated. It's the reason why I left San Francisco in the first place and why I hated growing up in my parent's house. Slept at Happy Home Cottage, Timang. 2624m. Wifi, None. We walked an extra 2 hours to this village from the original one and it was all down. My bungalow on the right, the Himalayas in the back. I haven't had internet in days so I couldn't look up the differences in symptoms between normal AMS - Acute Mountain Sickness which can be cured by simply going down the mountain, and the more severe HAPE - High Altitude Pulmonary Oedema, which is when excess fluid starts building up in your lungs. The only things I remember about it is that it's likely fatal if untreated, and one of the symptoms that isn't part of normal AMS is a cough, which I was now coughing harder than I've seen anyone in my life. It's crazy that I'm swinging day from day curing one problem and having another catch fire. I can't wait to just be warm again and feel healthy. The ironic thing is that in terms of the actual trekking I did feel healthy. The couple months of training on the mountain in Chiang Mai while carrying a loaded backpack really helped. But if anything it was going too fast up and pushing myself too hard the first couple of days that got me sick in the first place. As much as I try to avoid antibiotics, I finally broke down in the middle of the night and started a course of Amoxicillin which is a broad spectrum antibiotic that's good for bronchitis, throat infection, tonsillitis, and pneumonia, which I'm guessing I have at once one or more of. The only good news is that i'm starting to be able to eat child sized portions of food again, and that I had a beautiful walk today and really got to enjoy it. I love hiking, being in nature, off the grid, and don't mind roughing it. But what I really hate is the cold. My body has always rejected it and I've finally come to terms with that instead of trying to force it. As crazy as it sounds, I'm actually really enjoying this trek, and if nothing else, getting sick and needing to go down might have saved me from dreading it on top where I know I'll hate the cold as it gets to -4F/-20C at the top. From now on you'll only be seeing this guy in more Johnny friendly locations, whether it's scuba diving somewhere warm or hanging out somewhere where even light jackets are optional. My goal is to continue walking down village by village and really enjoy the hike for hiking's sake instead of with the goal of getting to the top. It's so beautiful either way that even it this was the entire hike and there was never a summit to reach, it still would have been worth the trip. Slept at Potala Guest House, Danaque. 2200m. Wifi: Good. I managed to reply to all of my emails, and even watch a Youtube video. Facebook still crawls though. Today's walk and view. It looks even better in person! The only good thing about coming down slowly off the mountain is being free by 3pm and watching things on my laptop as I still can't use my voice. Thankfully my blog is written`as being sick has really reminded me how useless I am if I can't make videos or record podcasts. For whatever reason, I'm obsessing over watching videos on Youtube where people convert Van's into tiny homes. It seems like such a great way to travel, and it seems to have a lot of the comforts of a Tiny Home which I find fascinating, while being at the same time much easier to transport around. When my internet got too slow, I moved to my room and caught up on episodes of Narcos that I had downloaded offline for occasions just like this. In terms of the hike, I'm still slowly making my way down. It's actually kind of crazy to believe how much ground I covered on my way up and how quickly. I'm sure if i pushed myself I could finish the hike within a day or two, but I'm honestly enjoying waking up late at 8am, having a casual breakfast, then walking just a few hours a day to the next village. Slept at Tashi Delek Guest House, Tal. 1700m. Wifi: Good. Actually able to use Facebook, wow. The garden where fresh dinner was picked from. As I was walking down the trail today, I saw a familiar face. It was Grace from Wisconsin who was ironically the last person I walked with before getting altitude sickness. The difference though is that she had made it a lot further, to the village just past Manang at Yak Kharka situated at 4,050m. I'm assuming she either didn't acclimatize long enough at each step going up, spent enough time in Manag itself, or she hiked too fast at the higher altitude. Either way it sucked to see her coming down the mountain on a 4X4, but I was lucky to happen to catch her stepping out of the jeep for lunch. Her story just reminds me how important it is to go super slow at altitude and that AMS hits a lot of people, and it's up to us to educate ourselves and keep ourselves safe. Luckily seemed to be feeling fine now that she was at lower altitude, and with my cold and voice loss, i'm still actually in worse shape, or at least sound like it. Not only her story, but the other people I've met while coming down the hill has all reminded me how big of a money maker emergency evacuation is for the locals whether it be on motorbike, 4X4 or by helicopter airlift. None of the guest house owners seem surprised when they hear someone got AMS as I'm assuming they see it everyday. The fact is, it seems like as long as you catch it early and stop ascending when you start seeing symptoms, things won't be that bad. It's only in cases like mind when you get sick and your guide takes you up further that the real damage happens. Day 12: I've Made It! Today was the first day since they day I got sick that felt great and determined again. I didn't actually know we'd finish today, but I knew we had a chance if we started early and walked throughout the day with minimal stops, and almost out of nowhere, seven hours had passed and I looked up to see Manang Hotel in Bhulbhule. I looked down at my watch and it was 4pm and we had made it. After about half an hour of waiting, I hopped on the local bus to Besisahar and right away I was transformed right back to day one where I couldn't help smile at the chaos of the blarring music, overcrowdedness, and the characters on board. Even with the bus being stuck for half an hour in the middle of the road due a truck breaking down in front of it, it was still overall an enjoyable experience and definitely memorable. So here I am now, at what feels like a crazy busy city, even though Besisahar is a pretty quiet town. It just feels different to be back around so many people, off the mountain and back into normal life again. It's also a strange anti-climax as since the Annapurna Circuit is trekked in a circle, counter-clockwise only, no one actually comes back to the start and very few people walk back down after they get sick as they usually just take a 4X4 back into town. So here I am, having a cup of hot ginger lemon honey tea thinking okay, now that's over, now what? My voice is still gone, but the coughs are getting less intense, and the AMS has completely went away. My plan is to take a bus from Besisahar to Pokhara tomorrow morning, and spend a week there relaxing, recovering, and figuring out what I want to do next. But for now, cheers! I know it's not the hike I originally set out to do, but at twelve days long, it still ended up being the longest I've ever been on. Slept at New Throungla Guest House, Besisahar. 820m. Wifi: Good. Able to facebook, youtube, etc. In the bus at the end of my trip. An example is a group of 9 trekkers that met in Pokhara that ended up starting the trek together and later split up to go their own ways. 5 of them made it without issue, but 4 of them got AMS at some point and had to turn back. Another guy at the hostel had broken glasses that he said was from falling over during the trek after being light headed and getting AMS. It seems to be an even bigger deal that happens to close to 40% of trekkers that few people talk about after it happens. For Nepal, emergency evacuations, helicopter lifts, and jeeps down make just as much money if not more than the actual tourism dollars they make from trekkers staying in tea houses so there's a big chance the actual number gets unreported for a reason. It shouldn't be something to stop you from coming on the trek, but it's another reason to take it seriously and have a real game plan. "I will not ascend more than 700m a day. If I do, I' will sleep lower than at a 700m gain." "I will drink 4 liters (3L for women) of water per day. If I don't, I will stay awake until I have a minimum of 3L." "I will take the AMS test twice a day, if I score a 3 or higher I will stay at my current elevation for 1 night and test again. If I score a 6 or higher I will immidently descend down 500m to the next lower village and rest a minimum of 18 hours before testing again." "If I score a 9 or higher I will descend 1000m or until symptoms clear completely and wait 40 hours before climbing again." Print or Save this AMS test to bring with you. Coming to Nepal and going on the Annapurna Circuit trek was one of the best things I've done on my travels. I'm currently sitting in a really nice coffee shop lakeside overlooking the mountains here in Pokhara at the end of the trek and can see why people would come here as a dream destination. It's not going to be for everyone as it's a lot more rustic and dusty than a lot of people would like, but for me it's the perfect balance of the old and new. There is just enough infrastructure here to be able to travel slow while working online, while it's off the beaten path enough to really feel a sense of adventure. Even the other tourists you'll meet here in Nepal are different as you can really feel a scene of adventure from them. Although trekking in Nepal is the easiest long distance trekking in the world as there are guest houses everywhere, it's still both a physical as well as a mental challenge and is by no means easy. But that being said, it's possible, really for anyone. If you have enough time, you could technically do the trek over 2 months by walking just village by village and staying overnight after each few hour walk. If anything, it would be a great way to spend a retirement, write a book, or just take your time enjoying life. It's been a few days since I got off the trail and I'm still a bit sick, but give me a few weeks and who knows, I might be back on the mountain again. The cold isn't for everyone, but for those who don't mind it, the scenery is worth it. The Annapurna Circuit is definitely a worthy bucket list item and whether you make it to the top or not, you won't regret adding it to your list. 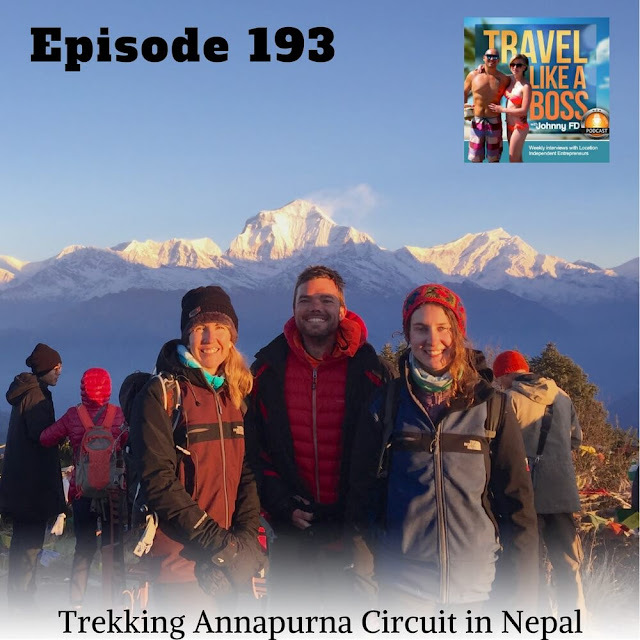 To get an even better feeling of what it was like on the trek, listen to Episode 193 of the Travel Like a Boss Podcast which was recorded live on the trail! Stay safe Johnny. If you are feeling really bad then its best you stop the hike and try again some other time. Your health is extremely important and some of us do care for you. Hey thanks Alex, I super appreciate your love and support! You were too lazy to go outzide for a hot shower, and had a cold one in the freaking Himalayas? Then when that made you ill and freezing you blame the hotel and the porter? What the heck dude. Nice blog, annapurna circuit trek is the best trek in Nepal. Your blog is much appreciated -- wishing you the best! Thanks Ken! I appreciate it! It's always the people who consider themselves "in great shape" who fail at this. They go way too fast and get altitude sickness. Then, instead of regrouping and trying again, they come up with some excuse (almost always "why am I doing this anyway?") to justify quitting. People who always try to prove how strong they are (a lot of amateur martial artists, for example), do so because they know inside they are actually weak and will quit at the first sign of trouble. Also, you packed way too much useless crap. And why a porter? If you can't carry your stuff on your own, don't take it. I did this trek in 2011, when I was 36 and pretty out of shape. I went slow and had no issues. I also carried all of my own stuff, which included about 10 lbs of camera gear. I'm not trying to brag, just saying people in far worse shape than you did it. I met a 55 year old guy just below the pass who had just beaten cancer. He was really struggling and didn't think he would make it. But he did. Because he had the strength to keep fighting. Hey you're right, I think a huge part of the reason I got sick was I was going at too fast of a pace in the start. I've also seen older people slowly walking up as I've been going down that I'm sure will do just fine. As for the "why am I doing this anyway" I added a section to clarify what I meant, as re-reading it now I can see why people could have interpreted it as "why am I doing this, anyway" instead of "what is the reason that I signed up for this even before things started going wrong." Hey, I just reread my comment and it feels a bit harsh. I'm sorry about that. I just kept having the same conversations every night on the trek where certain types would brag and try to one-up each other over how far they trekked that day. Inevitably, they would end up sick further down the line. And something in your post touched the same nerve. I'm not sure what, since it seems clear you weren't doing that at all. Maybe it's the way you updated it as you went, so it ended up going from "I'm going to write the ultimate Annapurna post" to not finishing the trek. I do think you should give it another shot, though. The scenery every day blows away the scenery from the previous day, right up until you get to the pass, so it's very much worth the effort (this is from someone who hates walking by the way). Just take your time. I know some people rush it (and apart from having health issues, they also miss out on everything that makes a trek like this worthwhile), because they have other obligations like work or family. You and I are lucky that we can take as much time as we want. It took me 7 days just to get to Tal! It sounds like you did enjoy the trek, apart from the cold (and being sick, obviously). I hated the cold too and was woefully unprepared, but I just bought some more clothes in Manang until I felt reasonably warm at night (never actually warm, though). If the weather had turned on me, I would have bought hiking boots too (I was trekking in canvas sneakers) and even spent a few days just wearing them in. So yeah, I hope you give it another try. Maybe go spend a week in Pokhara first. It's very relaxing and might be perfect for regrouping. It also makes the drive to Besisahar much shorter. Hey no worries, I'm finally at a point where I don't take things too personally anymore as I've realized half of the time it's not really about me in the first place. But yes, I know what you mean about the boasters. I ended up walking with a group of these guys for a bit, but then they kept saying, "okay one more town! we can make it, then it's only 4:30pm we can make it to the next one!" I bid them farewell and stayed on my own. I actually always dreamt about doing the Annapurna circuit as slow as possible and in my unfinished "My Ideal Would Have Trekked Schedule" it's actually relatively short days, but maybe I'd actually like them to be even shorter. Anyways, great idea about hanging out in Pokhara for a while to recover, that's my plan for the next week or so to see how I feel. Congrats on finishing it by the way, I'm sure it's something you'll remember for the rest of your life, and i'm glad you enjoyed it! Awesome blog entry, would love to do this too some day. Quick question, is there any way wifi would've been more reliable as you trekked up? My business is fairly passive online as well but I do have emails that I need to attend to. I'd even invest in some sort of satellite data plan (if not ridiculously expensive) if something was available. The only other options would be to buy a 3G USB adapter and see if you can tether off of that sometimes. You could also double check at each hotel before checking in to see their speeds as some where better than others. But as you get higher in the mountain, the less internet access you'll have either way. For emails though, if you set up offline email and have it push whenever you get to a village, you should be able to find a place everyday, maybe during your lunch break or one of the tea breaks to push out email. Awesome post, Johnny. Health over wealth. You can always return to Nepal. Kilimanjaro or other summits might have been easier for the first time trekking, but I'm no expert at this and you probably did your own research. Wish you the best in your future adventures and hope to run into you again in some other part of the world. I'm the Mongolian guy that you met in Chiang Mai, btw. Hey Z, Mt. Kilimanjaro sounds awesome as well. We'll see what ends up on my bucket list after I recover a bit. But you're right, I can always come back to Nepal, and it's a great country so why not? Haha great last line there Robert. You're right, we can't help everyone, but what we can do, and what's our responsibility is to put the info out there for people who choose to find it. Being an old cat... I did a lot of trekking/climbing around there... Everest basecamp and surrounds and from the Tibetan side in the late-80s (+ through the Afghanistan, Pakistan, etc).... pre-internet, pre-mobile phones and acclimatisation days are essential. I was in Aspen last year and on the day we arrived a travelling companion decided it was wise to go do a morning yoga session on top of Aspen mountain close to 4000m where I opted to eat a hash brownie and go fly-fishing on the Roaring Fork River..... he was bed-ridden for 3 days with AMS and I was just stoned and went mountain biking for 30kms the next day.... you've got to give your body some time to make changes. Regardless.... thanks for your honesty and candour and giving others a heads up on the dangers of pushing yourself too hard at altitude.... still, I'm glad you got to see that part of the world.... it's pretty special. Hey thanks for sharing your journey, that's awesome how many cool places you've been and that you've been doing it since the 80's! And I agree, it really is special here, almost magical, i'm glad I got to see it and hope everyone makes it out here. Hey Johnny, big props for sharing your story around AMS. Glad you made it down safely! I think AMS is often a subject that often overlook in the mindset of ascents but should be taken just as seriously as decompression sickness for diving. If you do decide to head up into the mountain again, I would recommend taking electrolyte packets and increasing the iron and copper (increased hemoglobin) intake in your nutrition before and during the trek. I suffered from HACE and HAPE in Tibet several years ago and couldn't sleep or eat properly for a oner week (no idea of the severity of the problem then) but the thing that got be back to normal within a few hours was being hooked up to an IV drip for proper electrolytes and hydration. Also loved the wifi updates, glad to see more digital nomads venturing outside the city stops. I actually spent a few months in Nepal trekking and building out a DSL store last year. Beautiful country, really shifted my perspectives of adventure and lifestyle and I will definitely plan on going back soon. If you need any tips or help in Pokhara, let me know! Hey Zaq, great info and advice. Sorry to hear you got hit with AMS in Tibet! Interesting read mate, anything you can walk away from is still a good outcome. A little saying I've benefited from in my travels, "things can always get worse!" - it sounds like you did a good job of fixing the situation yourself, so good job. Great post and video Johnny. I'm glad you didn't die! I always wanted to do this trek when I was younger but never did. I can't take the cold now either so I don't think it will ever happen. I did a trek through the High Atlas Mountains in Morocco back in 2001. We went up mount M'Goun at 4071m. Not easy but it was a wonderful trip that gave me many good memories. Thanks for sharing your experience. P.S. Are you still using your iPhone for video or something else now? Nice and smooth shots. Hey Terry, I know what you mean about the cold! I'm glad I didn't die either. =) And yup, still using my iPhone 7 Plus for videos. The built in image stabilization is pretty decent! Hey Cameron, I'm glad you enjoyed the post! I'm glad you liked the video! It was filmed entirely on an iPhone 7 Plus! Hey thanks, congrats on finishing Everest Base Camp! That's awesome! great post Johnny, i'm new to this blog. Found it from youtube. Been planning to do the circuit as well, but a bit worried about AMS as i experience some symptoms on the Annapurna basecamp. You made the correct decision to go back, hopefully when i do the trek and having the symptoms i can make the correct decision like you. Awesome blog and much appreciated your input as I am planning for mine end of this year. I have also forwarded your blog to my other friends who may be going with me. Well said Johnny and I hope you are feeling better now. Thanks for sharing your experience about AMS which I have zero clues. Cheers. I'm glad you're okay. I just listened to the podcast and you founded pretty defeated. This blog post is extremely useful, especially the wifi connectivity. I'm planning an Annapurna Base Camp trip this Nov but not a lot of information on wifi. I'm a freelancer so it's important to stay connected. Hi Angela, thanks for the comment, I fully recovered and am feeling great again thanks! I'm glad the blog post and WIFI reports helped as well. Enjoy your trek! Thanks for your honest blog. Not sure if have covered it elsewhere, but do you know the temperatures you experienced at the different villages you stayed at? It might convince me to fork out for -20C rated sleeping bag and to bring multiple base layers! Cheers mate. Hi, Johnny thank you for your experience and article. This post is extremely useful for those who are planning for Annapurna Circuit Trek in Nepal.